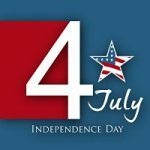 The 4th of July is celebrated in the U.S. as Independence Day, to commemorate the Declaration of Independence that was officially adopted on 4th July, 1776. It's a federal holiday and is associated with great fun and celebrations such as parades and firework displays, as well as carnivals and all manner of other fun things. And you won't be surprised to hear that here at LaffGaff we like to celebrate it with laughter in the form of 4th of July jokes. What was the craziest battle of the Revolutionary War? The Battle of Bonkers Hill. What do you eat on the 5th of July? The 4th of July is the day that Americans celebrate their freedom by sitting trapped in traffic jams for hours. One has a bill on their face and the other has their face on a bill. There was one little boy in the teacher's class who really struggled to learn. One day the teacher asked him who signed the Declaration of Independence, and of course he didn't know. The teacher asked him every day for a week but still he couldn’t give the right answer. Finally, in desperation, she called the boy’s father to come and see her. She said to him, "Your boy won’t tell me who signed the Declaration of Independence." The father said to his son, "Come here, boy, and sit down." The boy duly did as he was told and then his dad said to him, "Now if you signed that stupid thing, just admit it so we can get out of here." How is a healthy person like the United States? They both have good constitutions. What's red, white, black and blue? Uncle Sam falling down the stairs. Nothing says "Happy 4th of July" like passing down to your children the tradition of drunkenly blowing off your fingers with fireworks made in China. Where did George Washington buy his hatchet? Independence Day was approaching and the teacher took the opportunity to teach her class all about patriotism. At this, a little boy marched up to her from the back of the class, put his hands on his hips and said angrily, "I'm not free. I'm four." What do you get if you cross a patriot with a small curly-haired dog? Who was the biggest joker in George Washington's army? May your 4th of July fireworks cause less personal injury than your 4th of July alcohol consumption. Independence Day is the day that Americans proudly wave their American flags that were made in China. What do you get if you cross George Washington with cattle feed? The Fodder of Our Country. Because she can't sit down. Which colonists told the most jokes? I just bought a car flag for Independence Day for just two dollars. What has feathers, webbed feet, and certain inalienable rights? What did one American flag say to the other? What do you get if you cross the first signer of the Declaration of Independence with a rooster?